Tycho Brahe (1580's) was astronomy's 1st true observer. He built the Danish Observatory (using sextant's since telescopes had not been invented yet) from which he measured positions of planets and stars to the highest degree of accuracy for that time period (1st modern database). He showed that the Sun was much farther than the Moon from the Earth, using simple trigonometry of the angle between the Moon and the Sun at 1st Quarter. Tycho's measurements were used to show that there was no detectable parallax with the naked eye, in support of the geocentric theory. So, even though his observations were the best for his time, his result was wrong, a lesson in how science is done. Despite the lack of parallax, Tycho was doubtful of a pure geocentric model and attempted to formulate two compromise models shown below. Neither successfully predicts the motion of the planets. The solution will be discovered by a student of Tycho's, who finally resolves the heliocentric cosmology with the use of elliptical orbits. 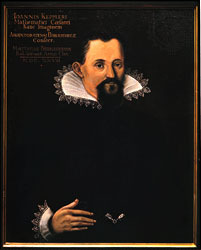 Kepler (1600's) a student of Tycho who used Brahe's database to formulate the Laws of Planetary Motion which corrects the problems of epicycles in the heliocentric theory by using ellipses instead of circles for orbits of the planets. This is a key mathematical formulation because the reason Copernicus' heliocentric model has to use epicycles is due to the fact that he assumed perfectly circular orbits. With the use of ellipses, the heliocentric model eliminates the need for epicycles and deferents. The orbital motion of a planet is completely described by six elements: the semi-major axis, the eccentricity, the inclination, the longitude of the ascending node, the argument of the perihelion and the time of the perihelion. The formulation of a highly accurate system of determining the motions of all the planets marks the beginning of the clockwork Universe concept, and another paradigm shift in our philosophy of science. Kepler's laws are a mathematical formulation of the solar system. But, is the solar system `really' composed of elliptical orbits, or is this just a computational trick and the `real' solar system is geocentric. Of course, the answer to questions of this nature is observation. These first three are more of an aesthetic nature. Plato requires a `perfect' Universe. Spots, craters and a broken Milky Way are all features of imperfection and at odds with Plato's ideas on purely philosophical grounds. However, the laws of motion are as pure as Plato's celestial sphere, but clearly are not easy to apply in the world of friction and air currents etc. So these observations, by themselves, are not fatal to the geocentric theory. The next two are fatal and can only be explained by a heliocentric model. Notice that planets with phases are possible in a geocentric model. But for a planet to change in apparent size with its phases, like Venus is impossible if the planet orbits the same distance from the Earth. And, lastly, if all bodies orbit around the Earth, then the moons of Jupiter, which clearly orbit around that planet, are definitive proof that the geocentric model is wrong. Today our Solar System looks like this. With Galileo's observations and Kepler's laws of Planetary Motion, the heliocentric models begins to dominant scientific thinking by the 17th century, despite its theology problems. However, this is a kinematic description of cosmology, a contains only information about positions and motion. What is missing from 17th century cosmology is a dynamical description of the Universe, i.e. one that includes the cause of motion. Rationalism requires a logical progress from cause to effect. Cosmology will also require some cause for the motion of planets and stars. But first, ancient cosmologists needed to get straight the idea of motion on the Earth. 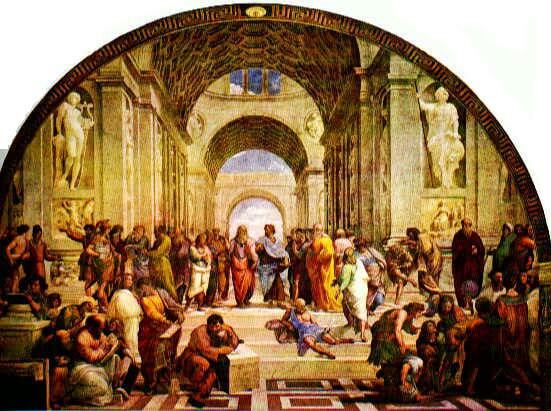 The first work in this area was done, of course, by Aristotle. 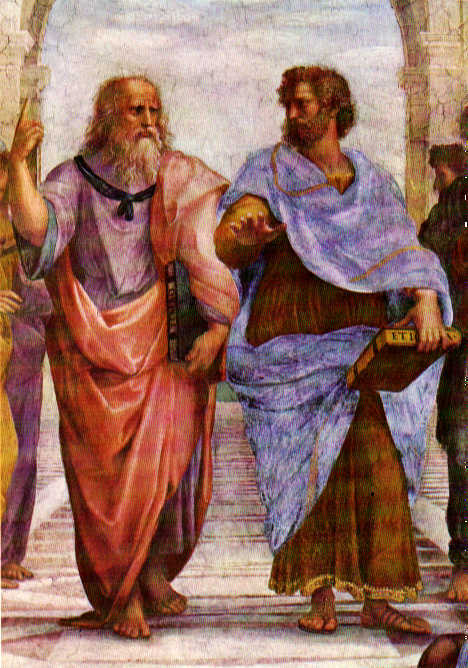 Aristotle constructed his view of the Universe based on a intuitive feeling of holistic harmony. Central to this philosophy was the concept of teleology or final causation. He supposed that individual objects (e.g. a falling rock) and systems (e.g. the motion of the planets) subordinate their behavior to an overall plan or destiny. This was especially apparent in living systems where the component parts function in a cooperative way to achieve a final purpose or end product. Aristotle also provides a good example of the way in which what one knows or believes influences the way one understands new information. His theory of motion flows from his understanding of matter as constituted of four elements: air, earth, fire, and water. Objects, being solid like earth, would tend to clump together with other solids (earth), so objects tend to fall to earth, their natural place. Thus, falling is a natural motion. Aside from his numerous inventions, Galileo also laid down the first accurate laws of motion for masses. Galileo realized that all bodies accelerate at the same rate regardless of their size or mass. Everyday experience tells you differently because a feather falls slower than a cannonball. Galileo's genius lay in spotting that the differences that occur in the everyday world are in incidental complication (in this case, air friction) and are irrelevant to the real underlying properties (that is, gravity). He was able to abstract from the complexity of real-life situations the simplicity of an idealized law of gravity. Galileo also showed that objects fall with the same speed regardless of their mass. The fact that a feather falls slowly than a steel ball is due to amount of air resistance that a feather experiences (alot) versus the steel ball (very little). Much of this thinking dealt with objects on the Earth. Galileo didn't extend his ideas to beyond the Earth's surface, that was for an astronomer named Kepler. Example: Cars and Trucks on Ice! A corollary to Newton's ideas was the so called Clockwork Universe model. A concept that states that the total momentum of the Universe is conserved, interactions redistribute the momentum, but the total never changes. In this model, God only starts the clock (initial cause), then it runs by itself for the rest of time. Example: from Newton's 1st law we know that an object travels in a straight line unless acted upon by an external force. A circular orbit is clearly not a straight line, what is the force? Newton showed that the planets are acted on by the force of gravity arising from the Sun. Each orbit is a constantly changing velocity where gravity adds a small ``delta-vee'' at each moment. This ``delta-vee'' is what produces the elliptical curvature that is the orbit. Example: from Newton's 2nd law when a baseball player hits a ball he applies a force, F, to the ball of mass m. Let's say he hits a tennis ball of mass of one-tenth the mass of a regular baseball (1/10m). What is the resulting acceleration? Ten times the acceleration of a regular baseball and, therefore, ten times the final velocity and ten times the distance hit. Example: You are trapped on a lake of ice with a sandbag. Remembering Newton's 3rd law, how do you escape? 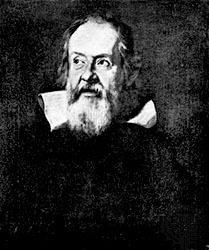 Galileo was the first to notice that objects are ``pulled'' towards the center of the Earth, but Newton showed that this same force (gravity) was responsible for the orbits of the planets in the Solar System.